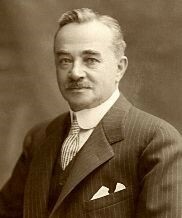 Milton Snavely Hershey was born on September 13, 1857 in the small town of Derry, PA. His mother, Fanny, was a devoted Mennonite. His father, Henry, was a dreamer who was constantly starting new jobs and working on his next "get rich quick" scheme. Because Milton's family moved so much, he didn't get a very good education. Even though he was smart, it was tough on Milton to always be changing schools. After the fourth grade, his mother decided that Milton should leave school and learn a trade. Milton's mom found him a job as an apprentice to a printer. After two years with the printer, Milton's mom helped him to find a new apprentice job with a candy maker. In 1872, Milton went to work for Joseph Royer at the Lancaster confectionery shop. There Milton learned about the art of candy making. He made all sorts of candy including caramels, fudge, and peppermints. He really enjoyed being a candy maker and knew he had found what he wanted to do. When Milton was nineteen, he decided to open his own candy business. Unfortunately, no matter how hard Milton worked, he couldn't figure out how to get his business to make a profit. He worked harder and harder, but soon he ran out of money and had to shut his business down. He moved to Denver, Colorado and got a job with a candy maker where he learned that fresh milk made the best tasting candy. He then opened another candy shop in New York City. This shop failed, too. Back in Lancaster, Milton once again started a new candy business. This time he would specialize in making just caramels. His caramel company was a huge success. Before long, Milton had to open new candy making factories and branches all over the country. He was now a rich man. Even though Milton was now a huge success, he had a new idea that he thought would be even bigger...chocolate! Milton decided to not only build a large factory in the country, but to also build a town. He built the town of Hershey with a post office, churches, and schools. The chocolate company was a huge success. Soon Hershey's chocolates were the most famous chocolates in the world. Milton and his wife, Kitty, were not able to have children. He used his millions to invest in a school for orphaned boys called the Hershey Industrial School. He died at the age of 88 on October 13, 1945. Kurt has been performing on local and regional stages for over 40 years. Since 2002 he has also entertained guests at Hershey’s Chocolate World in a variety of capacities, his most current role as a Digital Puppeteer. Kurt Dise is a proud alumnus of Central High School for Boys and Penn State University. Kurt’s business interests have traversed the insurance industry as a long-term care insurance specialist and consultant as well as his love of the arts. A recently narrated short film, The Custer Wolf, has garnered domestic and international recognition. Kurt’s connection to Central PA and Hershey began when he was a student teacher while matriculating at Penn State. He resided on Cocoa Avenue in a house built by Milton Hershey school students. He fell in love with the smell of Hershey’s chocolate wafting through the air from the factory, the roar of Hershey Bears hockey and the legacy of the town’s founder, who he portrays today. Little did he realize that he would one day marry the love of his life, who now works for the Bears, and raise his family near the town where his fondness for this area began. Life does imitate art.